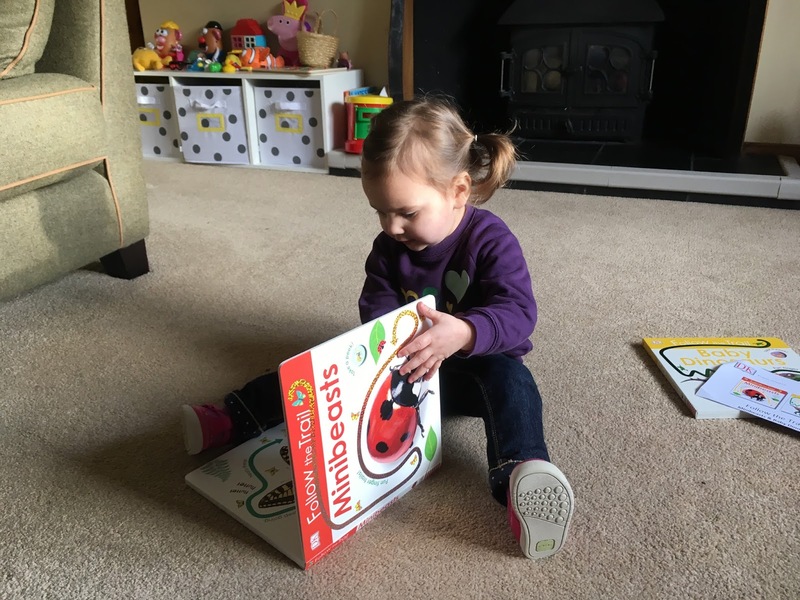 BookBairn loves reading books by herself. Yes, she will often bring books to mine and Daddy's feet all around the house declaring "daddy read it!" or "mummy's knees" (i.e. can I sit on your knees whilst you read me this book please mummy?). But she also loves to hit one of the many book cupboards, nooks, shelves, cases and drag her reading choice into her own lap and read. 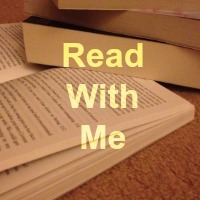 I say 'read' because clearly she can't actually read yet. She's not even two! 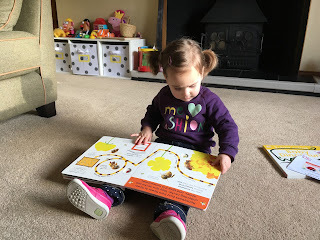 But she does have some pre-reading skills already: she can get the book the right way up, she can turn pages one at a time (even with a paperback) and she understands that we turn the pages from right to left to follow the story in the correct order. She looks at the pictures, she says some of the things that she can remember from previous reads with an adult or she describes what she can see. She's not even two! 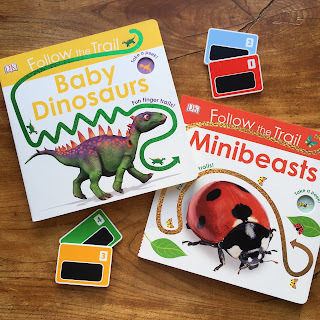 Looking to develop her reading skills further, I love the new releases from the 'Follow the Trail' series by Dawn Siritt and Charlotte Milner for supporting pre-reading and pre-writing skills. 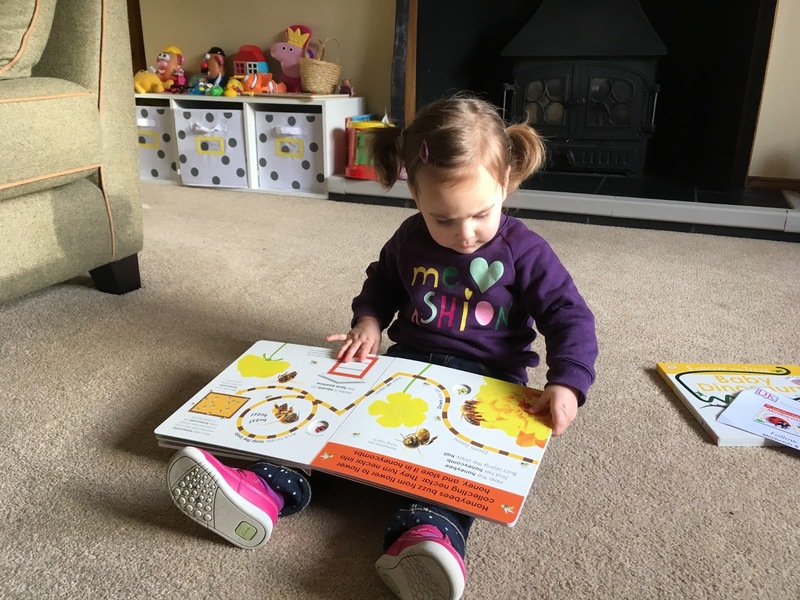 Each is more than just a non-fiction book for little one, though this is valuable in itself as many non-fiction books are very complex for younger readers and these ones are delightfully simple! However, as I say, they are more than just non-fiction, they encourage actual engagement with the pages. As you can see from the pages BookBairn is reading in the photograph above, the first pages feature lots of coloured and raised finger trails for little ones to trace their fingers over. Each page after features an non-fiction subject related to the book - we have the newest releases - 'Minibeasts' and 'Baby Dinosaurs' - so each page has a new species on it. There are some simple facts to read, key vocabulary highlighted in bold and several photographs rather than illustrations, as you would expect from a non-fiction text. But they also feature a glittery, bumpy, shiny trail that spans the double-page from left to right showing little ones the directionality of text and encourages them to 'follow with their finger' as they read or write the trail. Subtly woven into the book little ones won't be able to resist! There are also extra trails to teach little ones about shapes, colours, matching and sorting. And at the end of the book there is a great finger trail maze to match the appropriate beastie to it's habitat or baby dinosaur zoomed-in features to the image of the baby dinosaur. 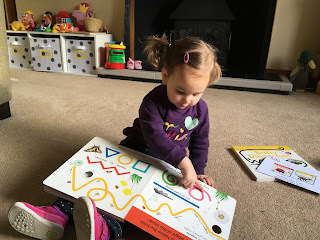 Great for reinforcing fine motor control and pre-reading/writing skills in very little ones! BookBairn had these books straight out of the parcel envelopes and has played with them daily ever since! She will be reading by herself in no time! But for the time-being I'm going to enjoy every minute of "mummy's knees" that I can! *Follow the Trail: Minibeasts and Follow the Trail: Baby Dinosaurs have a publication date of 28th February 2017. Other titles are available from the series now (Baby Animals, Farm, Trucks and Wild Animals). *DISCLAIMER* We were sent these copies of 'Follow the Trail - Minibeasts' and 'Follow the Trail - Baby Dinosaurs' for review by the publisher. But as always the words and opinions are our own. 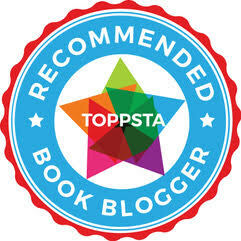 Another book achieves the "again" award from BookBairn. I watched her "read" these books on her own and she was really engaged. Definitely a "hit". Looks like Book Bairn loves those books. I love to see little ones reading. I love seeing little ones with books in their laps too! It's the next generation and all the hope for the future! That's so lovely! I can see how carefully she's following the trail. 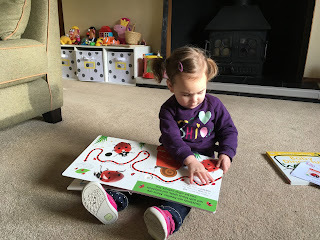 I'd never thought before about all the pre-reading skills like getting the book the right way up and turning the pages in the right direction, but time on Mummy's knee has obviously been very helpful to her! I love to see young children with books. While other people buy babygrows and things when they're pregnant, I bought mostly books for my baby! (Everyone else bought clothes so he didn't go cold!) I read to him every morning from a few months old and I found one of his favourite books from that time the other day. It brought back some lovely memories and I was amused to find I could still remember the words without needing the book! I hadn't really thought about her outgrowing her books but I know I will enjoy that feeling of magic that you describe when I find an old favourite. And I'll always have this blog as a record too which is it's main purpose! It's funny what takes there fancy. For BookBairn it was cloth books - not bothered by them at all. Just wanted a 'real book' from the get-go!